Northfield Kindle owners: saving trees or destroying Division St. bookstores? I’ve owned an Amazon Kindle (wireless reading device) for about six weeks now. It’s been out for almost a year but I waited to see if there was significant industry and user momentum behind it before I ordered one. There’s lots to like about it. Among my favorites: reading in the bright sun; reading a book while eating — no hands required; highlighting and making notes that can be exported; free sample chapters of new books. There are two other early morning coffee drinkers I see who’ve gotten a Kindle lately. Hey, that’s almost enough to start a NKUP (Northfield Kindle Users Group.) Anyone want to organize it? We Kindle owners contend that we’re saving trees, of course. But are we undermining the local retail economy? Northfield’s Division St. has three bookstores: River City Books, Monkey See Monkey Read, and Bookfellows. So, perhaps the delays in a library expansion were a godsend. Clearly, the Kindle and its competitors will be the source of the future. Of course, many in the older generation will resist, others will provide a transition and children will grow up taking it for granted. The good news is that the library may be able to be transformed with only a modest addition, adding meeting rooms and reading rooms and community space. Sure, the transition will take a decade or more, but think of the options that soon will be available. (If you think that’s aggressive, consider who uses printed encyclopedias instead of Google or Wikipedia.) Older books will be able to be stored on computer, leaving the bookshelves for the most popular printed material. With new publishing technology, rare or rarely used books could be printed on demand for a fee, keeping physical space to a minimum. This will be a sad transition for those who deal in traditional books, but it will be decades before printed books are gone completely. After all, newspapers have been dying for 30 years. It’s a Brave New World out there Mr. Wigley. I’ll pass on the Kindle for now and await kinndle 2.0. No device required, just a chip implanted in your brain, books downloaded on demand, whatever Bezos wants you to read. Seriously, the Kindle is not the ipod, which is wreaking havoc among music retailers. My greater concern is the lack of feet on the street. Where have all the customers gone? We’ve had some long lonely days in the store recently. Internet biz is down right now. Mr. Paulson, Mr. Bernanke, toss a crumb my way, I’ve got plenty of worthless paper to sell. Some is actually worthwhile. Seriously though, they are an amazing device, but I am still very much stuck on paper bound books version 1.0. Call me old school, but I like the stone tablet approach. You also have to factor in the petroleum products in the case, and the hazardous waste materials on the board and batteries. There has to be a trade off here. I like technology, but I am becoming much more aware of what I “want”, what I “need”, and the fact that I may not need a $400 device to do a particular task. $400 buys a lot of used paperbacks, and supports my local bookstore, as well as the local economy. A geology colleague of mine came down from the Cities today and we went to see Ray Jacobson’s Harvest sculpture in the new parking lot (and id the dimension stone pavers he has used). Ray also has a boulder sculpture at Gould Library so we went over to get a professional opinion on the enigmatic rock. Chatting over lunch about Renoir, I mentioned my ArtSwirl 2007 re-enactment of The Luncheon of the Boat Party which we did at The Cow. My friend whips out his Kindle (thank goodness I had just read Griff’s post this morning so I pretended to know all about what it was) and he pulled up my artonwater.com and we viewed the work on the gallery website. When I mentioned that Susan Vreeland had written a whole book about it (Renoir’s work, of course), he ordered up a free sample of the book on his Kindle and, while perusing the chapter, were able to click on a word and get a dictionary definition. By the way, my friend and his wife actually did physically come by my gallery to see the framed Renoir re-enactment piece. I feel your pain, Jerry. The world is being reconfigured as we speak and the customers are in serious retreat right now. I was listening to Bill O’Reilly moments ago and he made an interesting point: at the recent national party conventions which occurred just 4 weeks ago, there was not a hint of concern about an impending financial crisis, one which has seen a loss of over 2 trillion dollars of retirement income. My response to this thread is that the Kindle is a whiz bang device and we can’t know right now what it’s long-term impact will be. However, the main benefit that I can see from most electronic devices is that they enable us to conduct our lives FASTER and provide access to more detail FASTER. I don’t know if this is good or bad. Maybe it’s only a matter of preference. I want to remind us that some of these developments would not have been possible if it weren’t for the fact that our government in its infinite wisdom forgave internet merchants from the nagging collection of sales tax for YEARS and Wall Street forgave these same merchants from earning income for YEARS. They could not have survived or created new products without these allowances. The rest of us did not receive such incentives. Dan : Great comment in that you took the subject to a broader area of even wider concern. I fear for our collective sanity if speed and ease of access is the goal of every process. (Picture the rats in the maze, relentlessly trying all pathways) That mindset emphasizes the educational “misfire” of “teaching to the test” . Where are the skills being taught which emphasize creative thinking, analysis, research of thoroughly “vetted” materials? The internet is fraught with incorrect or partial information, as well as thoroughly researched solid information. One has to be able to sort these two worlds out. I find it telling that so many college profs do not allow certain internet citations in research papers. We cannot trade “fact” junkies for critical thinkers. We as a society will lose something of great value if we reject all more traditional forms of information gathering which do not just “feed” info into our thought processes, but allow a pace which encourages reflection and introspection along the way. Anne, I think your statement is premature. 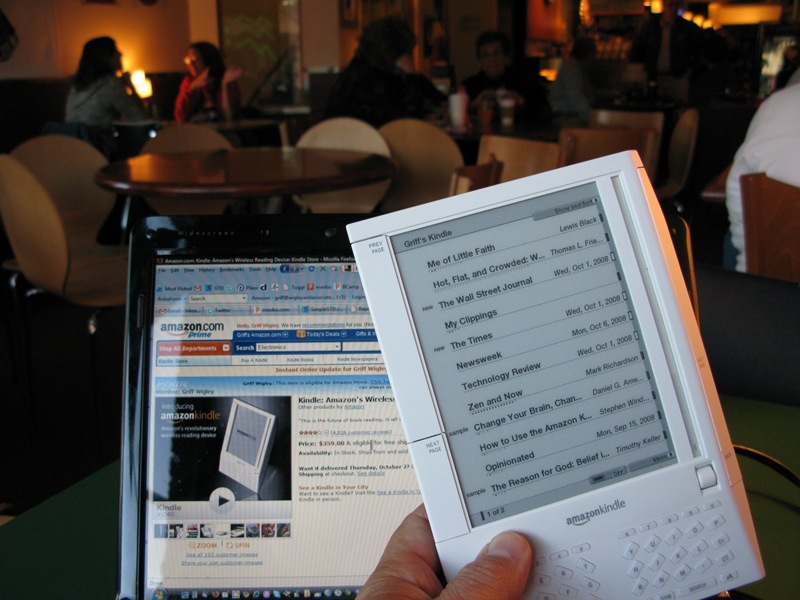 The electronic book has been around for more than a decade and less than 1% of us use it. MP3 players have been around almost as long and they have taken hold in the marketplace. the print on demand book is a great use of technology, but still very inefficient compared to the traditionally bound book. These are still niche market uses of technology. In 1995, the book and bookstore will declared dead. 13 years later retail space devoted to printed books has grown exponentially. I have to agree with Jerry (comment #7). I’m an avid reader and can’t imagine life without physical books. I spend a lot of time on the computer most days (primarily work-related, but also to keep up with local news here, for example, and for infotainment — check out Red State Update on youtube for example) but no day is complete for me without a real book in hand at bed-time. When I recently took a trip to the Boundary Waters, I brought a book with me, and can’t imagine taking a Kindle with me to such a spot. Of course I’m an ancient, but my two kids (19 and 16), while as technophilic as most of their generation, are also book-lovers. My 19-year-old daughter, Maia, for example, has already amassed quite a personal library and is continually adding physical books to it. Long may the book live! This isn’t an either/or situation right now. As I said, I think the transition will take 30 years or more. And there may be a place for some books, mainly recreational reading, for quite a while longer after that. But change is coming and it matters. Textbooks and academic resources are shifting quickly to online for good reason. (Think of economics and business professors keeping up with the current situation with paper books). My husband is teaching college courses online and using online resources for other on-campus classes, and he’s adapted quite well. And he’s even older than I am. Phoenix is doing classes without paper textbooks. Some of the academic journals he is using for his PhD are only available online. People are watching television on their cell phones and still buying 52-inch flatscreens. People like newspapers, but the publisher of the New York Times is declaring that the print edition will be gone in five years. Huffington Post is one of the most ‘read’ publications in the country and it’s never been in print. I read more papers online than I would ever read in print, and I read the weekly ads of any store I choose, e-mailing ideas to my daughters and shopping with them cross-country. The Rake magazine in the Cities has converted to online. All I’m saying is that the transition is happening. Just 25 years ago people never thought bank customers would give up the personal touch of a bank teller to use an ATM. People thought old folks wouldn’t get used to cell phones, but we’re old and we gave up our land line two years ago. We pay bills online, shop online, talk to our grandkids on webcams and store our photos on the computer or in a single digital picture frame instead of photo albums. I look for recipes online and haven’t opened a cook book in ages. It just makes a lot of sense for library planners to focus on moving reference materials and rarely used volumes to digital files (with print on demand capability) and focus on designing common social and gathering and gallery and performing areas – with books – that are flexible enough to change as future needs change. I’d guess book stores that co-located with cafes and galleries and other retail might be interesting as well. As for a slower pace, you can think at any pace you wish. Online information is a tool, one that broadens our thinking and gives us a more global view that we could ever get before. And while there is some bad information, the Internet has been crucial in debunking lies within hours, or minutes. Technology will be the answer. Perhaps science will give us a computer book with a paper feel, perhaps a multi-page flexible screen designed to look like a book, but able to hold multiple volumes the way the iPod and multiple docking stations have replaced the stack of CDs you hauled from your car to your den. All I’m saying is that it’s an exciting, amazing future ahead. What a great time to be alive. space saving device, but maybe books are a great way to hold temperatures steady in the home. Back in June, the pollster Zogby International (along with Random House) conducted a poll that indicated that 82% of readers preferred traditional printed books to e-readers. In my opinion, the greatest thing the internet (and technology generally) has done for reading has not been Amazon.com or Kindle. It has been the proliferation of book bloggers and book-related social networking sites (like LibraryThing), creating a virtual community of readers around the globe. On the internet, I’ve found a wonderful community of readers who share my reading tastes. I’ve had LibraryThing friends send me books (duplicate copies from personal libraries, or simply outright gifts) from as far away as New South Wales, Australia. I can’t count the number of books I’ve bought because an LibraryThing friend has recommended it. So for me, the real story is not Kindle, it’s the ways in which the internet has brought readers together and strengthened the culture of the printed book. I don’t have the stats available right now, but Borders and B&N have each opened 40 stores a year for the last 15 years. avg store size is 25,000 square feet. Indies have grow in recent years. Walmart and Target have added books and opened more stores. Even Menards sells books now. Many people contend this “paperless society” is a way to be environmentally friendly- but do not forget the amount of toxic heavy metals that go into each of these electronic devices and will have to be disposed of when the next catchy new model comes out. A Kindle will be obsolete in a few years, and who ever dreamed of throwing out your collection of books and buying fresh ones in two years? Actually, I have to admit that I’m seriously considering this new product invented by a bookseller in London. Why isn’t my link working? Stupid technology. Here it is: the new alternative to a Kindle or Sony E-Reader. I fixed your link, Rob. I can see now that I should have passed on the Kindle in favor of the Pony! I will be selling custom made to order Ponies in the store for just $100.00. What a Bargain! Three color choices available, purple, black or highlighter yellow. NY Times: Bargain Hunting for Books, and Feeling Sheepish About It – Book publishers and booksellers are faltering. But don’t blame the recession — it’s all the fault of the Internet used books market. It’s survival of the fittest. we all have to decide what we want our communities to look like. Let your pocket book doing the talking. I’m having a good Dec., better in store than online kindle boy. Thanks for posting the link Patrick. That story just made my day as both a proponent of paper books and a lover of George Orwells work. One could not have scripted this any better. All I can think is that Orwell predicted this situation in 1984 with Winston going back and editing/correcting newspapers that have a problem or don’t jive with the current government story. If amazon can reach in and take something that I have paid for what is to stop them from reaching in and editing the classics as they see fit? Those bastards! Ah well, I still like buying the Sunday NY Times every week for 75 cents. No pictures but no ads and no recycling. kindle vs the book, blog style. funny stuff. I read books on the ipod touch. I haven’t seen anyone using the app, but people have been in my store taking pictures of books they plan to obtain elsewhere. The two I’ve confronted denied it. Give me a break, is there anyone who takes pictures of books for posterity purposes? I spent 30 minutes with a customer recommending books only to have them tell me they have an ereader and wouldn’t buy any of them for me. I realize this door swings both ways. many people read book reviews online and buy the books from my store. Jerry- Taking pictures of a book to order (supposedly) on the internet seems “spineless.” I experience the same thing in the furniture industry. We have people come in, sit on a sofa or chair to see how it fits, then order it from a web site. It is probably a person operating out of their bedroom office with no inventory or overhead. I’m not sure where this whole thing is going, but I’m glad I am near retirement, so I don’t have to put up with it much longer. I’ve snapped a photo in a store and sent it to myself so I could look up the product (a game) online. But went back to the store to buy it so the store came out just fine. But then perhaps I am atypical (persona note to Curt, that means not typical). Jerry, those folks aren’t taking photos of the book. They’re using an app to scan the book’s barcode/ISBN number. The app uses the smartphone’s camera to read the code so it just LOOKS like they’re taking a photo. The app then serves up links which allow them to read more about the book on misc websites as well as to comparison shop. My advice would be to not assume they’re misbehaving but use it as a discussion starter about the book, which is one of the big advantages of shopping at your store. You know books! I am a new Kindle owner and I love it. I also love my paper books and continue to read on both–but for travel, the Kindle wins hands down as it is much easier to carry. I read two to three novels a week so when I travel half of my luggage is books–now with the kindle it is only the weight of a paperback. Nothing with replace the paper book for reading to your children from great picture books or getting the next library book because the Kindle version takes too long–but I have to say that I am embracing the change and saving trees, too. I can also take my own word documents on my kindle which is a big deal since I do a lot of review of business documents. Ny favorite bookstore is Jerry Bilek’s Monkey See Monkey Read and I do not favor e buying over local purchases–I would much rather shop local. I am with you Jane. I just got the Kindle Fire and absolutely love it!!! I travel A LOT with my job and this is fantastic, plus very affordable. Fits nicely in my purse with no bulk. No books in my suitcase…YES! I do also purchase paperbacks and will continue to, but while traveling…I LOVE MY NEW KINDLE FIRE!!!! the two people I saw, were taking pictures of the front of the book, not scanning the barcode on the back. I think the natural assumption is amazon has a lower price on everything. it’s a myth. for example, I checked my price vs amazon on calendars. I’ve beat them on every calendar I carry. I just sold a used book to a customer for 40% less than the shipping amazon would charge. that’s with the sales tax. sometimes I’m cheaper, sometimes they are.